No. 53, Jalan Mivo 1, Taman Perindustrian Desa Aman, 52200 Kuala Lumpur, Malaysia. 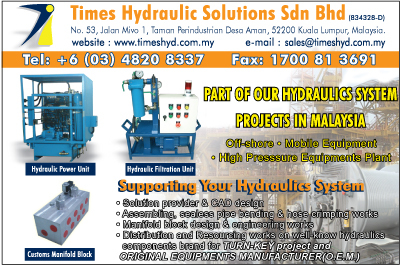 TIMES hydraulic Solutions Sdn Bhd, was incorporated on 29 September 2008 under the Companies Act 1965 with company registration no. 834328-D. It is wholly-owned by Malaysian and formerly known as ” Times Hydraulic Solutions”.